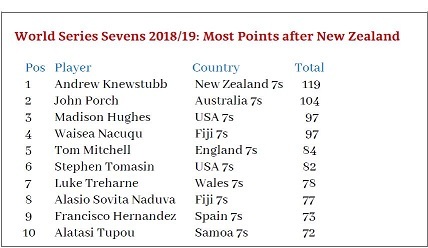 The Flying Fijians humbled the United States of America 38-0 in a six-try stampede yesterday (Sunday) to take the New Zealand Sevens Crown and draw level at the top of the world series rankings. 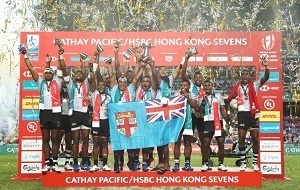 Fiji walked away from Hamilton with back-to-back titles in both New Zealand and the world circuit, once again depriving the Eagles of a Tournament win despite making the finals of all three occasions in the 2018-19 series so far. Fiji were never utterly challenged from the time Jerry Tuwai opened the scoring from a lineout steal in the second minute. Alosio Naduva scored a double in the second half and Tuwai bagged his second while the eventual runners-up were left scoreless. Earlier on Fiji came through the final day’s knockout matches with a 31-7 win over Canada in the quarter-finals before sending the South African packing with a 29-7 demolition in the semis. The US team, who have been very impressive and are emerging as a powerhouse in Sevens Rugby, had a 19-14 win over Scotland in the quarters. They had lost their star player in Perry Baker on day one due to injury. 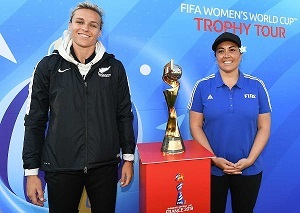 USA were trailing by 7-Nil but they managed to overturn this by coming from behind to beat hosts New Zealand 17-7 on the back of a one-man advantage after Regan Ware was yellow-carded for a dangerous tackle. 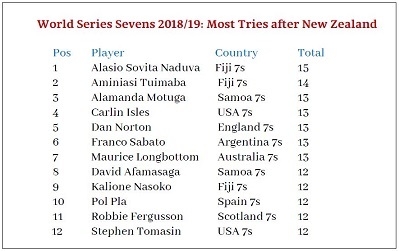 Fiji and the US now lead the overall standings with 57 points, one ahead of hosts New Zealand, who beat South Africa 29-7 in the bronze medal match. Yesterday’s Runners-up lost to New Zealand in the season opener final in Dubai and went down to Fiji 29-15 in Cape Town. England started the weekend from fourth in the series standings but failed to qualify for the play-offs. They later recovered to beat Kenya 36-7 in the Challenger Trophy final to be fifth overall in the series, six points behind fourth-placed South Africa.